Is the Solar Panel Dictate a Scam? As we were enjoying our trip to the former Communist country – Russia – the news broke that the communist country I live in had issued a new rule that all new homes built in California starting in 2020 had to be powered by solar panels as part of the initial construction. It was stated by the California Energy Commission (CEC) that the homeowners would experience an actual savings over the life of the panels. After reading multiple reports from the lame press that just regurgitated the cheery analysis from the commission, I decided to investigate the matter upon my return home. It is not as if I was unfamiliar with the idea of solar panels. Over the years, I have been provided with bids for our home which turned out unsuccessful. We have a perfect home for the installation as we have an unhampered roof with a significant south-oriented face that would lend to soaking up the Southern California sun on a daily basis. The cost was still astronomical compared to our usage, partially because I am stingy about the use of electricity. This is despite the fact that the state has mandated “renewable sources," which have soared the cost of electricity for Californians in recent years. I contacted the CEC to get their take on the new policy adopted by a 5-0 vote. Amber Beck, their Public Information Officer, promptly contacted me back. I must say I have chased information over the years from many elected officials and government agencies and never had such a positive and cooperative response as I did from the CEC. When I kept digging in on my attempts to understand whether this made sense, Ms. Beck kept on providing more info until she finally hooked me up on a conference call with Mazi Shirakh, senior mechanical engineer. They were extremely open, and I confirmed with other parties that the CEC had a very open process. 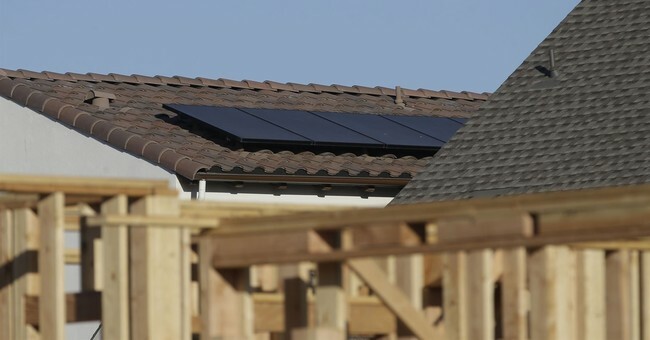 The law requires a newly-built home to install a three-kilowatt system on the roof of the structure or in the back yard. The CEC is dictated to make any changes cost effective; thus, that is why they limited the system to three-kilowatts. This is based on a home that would be between 2,200 and 2,800 square feet. The system cost projected out to add about $9,500 to the home. The Wall Street Journal stated that the average price of systems nationally ($18,840) is about twice what the commission was quoting. Mr. Shirakh stated the savings were partially due to the equipment being an original installation versus a retrofit on an existing home which drives up the price. What appears to have become clear is that the other systems may have been larger -- like a six-kilowatt system. I had read that the cost effectiveness of the electricity generated from solar panels on a home are not at the level of a solar panel farm. Also, the panels on your roof are not necessarily the most attractive element of home décor. Mr. Shirakh agreed that home panels are not as efficient as farm panels stating that the electricity could be derived from a local farm as part of this new law. I finished the teleconference thinking much more positively about the law. I am never happy about government doing broad-based dictates like this. My instinctive thinking is if solar panels make such sense why would builders not just jump in and do it without government coercion? Since I had received numerous assurances and open responsiveness from the CEC I felt more comfortable with what was being done. I even called back Ms. Beck and applauded her for the CEC openness. In the CEC literature they quoted the head of the California Building Industry Association (CBIA) saying positive things about this new rule so I decided to question the group about their thoughts. I spoke with Bob Raymer, their Technical Director and an engineer. Bob stated the CEC was extremely open and cooperative, but he made clear the picture I had was a little different from reality. Mr. Raymer told me that because of the dictate that the CEC control its costs to consumers, their new rule requires limiting the system to three-kilowatt. He believes that the system is inadequate for the homes being built which will cause the homeowners to use electricity from other sources. The timing of when they would need the electricity would most likely be during peak hours. The electricity in California is largely based on time of usage, thus electricity during peak hours when the homes would have to be supplemented would be costlier. The way to circumvent that would be for the home to have a battery installed in the garage which would store the excess energy derived from the system for later use, but Raymer said that is an additional cost ranging from $3,000 to $15,000. Raymer also stated that the solar energy could be derived from a solar farm, but his understanding was that farm had to be directly related to development. Thus, this would only make sense for developments of significant enough sizes. The developer would then have to locate a place for the farm where the land was cost effective. I had been told that the estimated costs of the solar panel system included maintenance, but Raymer made clear that the maintenance cost was not included. Since many homeowners, even in new construction, were opting to lease their systems they would not have an additional maintenance cost. For those who paid for their own systems, maintenance would be an additional cost that would lower the projected cost savings over the life of the system. The costs of maintenance drives up the cost of the lease since that is embedded in the monthly fees. In conclusion, the projected savings by the CEC appears to be significantly overstated as the cost of auxiliary electricity and maintenance would undoubtedly cut into the projected monthly savings the CEC had stated of $40 per month over the projected 30-year life on the system. There are other factors as well. Having experienced construction myself, I know that the costs tend to spiral upward from original estimates. Whether the cost of the systems begin to climb because of the requirement being in place is another intangible. The program is not as horrible as I initially thought it was, but it certainly is not as attractive as the CEC purported and the MSM swallowed without much analysis. The good point is the CEC stated this is open to alteration if experience favors that once it's in place in 2020. It certainly may need it.